Most individuals, whether adults or children, may suffer from a headache every now and again, which is mostly mild and fleeting. Although there are some who suffer from more chronic and severe headaches, called migraines and even more often than usual. In this case, you can reduce how often or severe the pain is by your own efforts, one of them which we will be discussing, a Migraine Relief Pillow. I would recommend that for chronic and very severe Migraines or Headaches, you also seek medical advice to address the problem. There may be many reasons why you suffer from Migraines, it could be tension, your diet, stress, along with other factors or conditions. Choosing the right sleeping aids and products can most definitely make a difference, by providing pain relief and comfort. When it comes to Migraines caused by stress and Tension, a good and supportive pillow can help a great deal. Headaches, Migraines and even snoring are mainly symptoms that become worse when there is poor blood circulation or an oxygen deficiency. The right pillow can aid in improving your overall sleep posture, supporting your cervical alignment, giving you a peaceful and restful sleep. The Pillow that you choose should properly support your body and align your spine, in the specific position that you sleep. Some pillows offer better support in certain sleeping positions, while there are a few that cater for all sleeping positions. 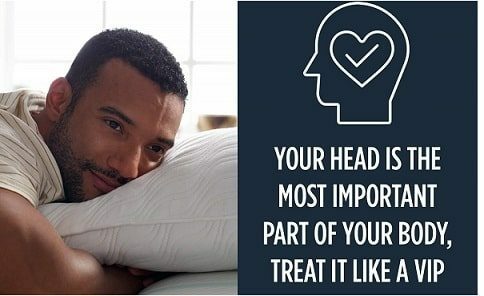 Your head and neck relationship when you are sleeping is critical as it supports the gateway between your spine and your brain, where your central nervous system carries all pain responses. Thus, a healthy position of your head and neck when you sleep allows better blood flow and healing, along with better brain functioning and activity, so you can eliminate pain easier. As I have mentioned, it is critical that your head and neck are supported ideally to get the best spinal alignment, in order to respond to pain in a better way and support healing and alleviation. Your sleep position during the night needs to support your head and neck, about the rest of your body, offering the best spinal alignment, for effective rest and pain relief. Therefore, to come back to my point, the right pillow for your sleeping position is crucial! Individuals who sleep on their backs require a Lower Profile Pillow, so that their head is level with their shoulders. Stomach Sleepers place much strain on their body with this position, thus a soft, and very Low Profile, or Even No pillow at all, is ideal. Lastly, Side Sleepers which, is the most common sleep position, requires good neck and head support for proper spinal alignment, and consequently need a much firmer and higher profile pillow. Look for filling such as memory foam or latex in a firm option, or feather, buckwheat or microbeads in a softer and more adjustable option. Make sure that the pillowcase or cover is of a durable and breathable material, a natural cotton is always a good option. The loft of the pillow will depend on your sleeping positions whether you need a high, medium or low profile pillow. If you sleep in different positions, look for a pillow that is more adjustable and moldable, or that has a design to offer support for your required sleep positions. Make sure that the pillow is comfortable, first and foremost. This pillow is ideal for all sleeping positions and provides you with the best head, neck and cervical support, for proper spinal alignment that aids in more peaceful sleep and better pain relief. Manufactured from premium quality soft Tencel Blended fabric and mesh, for super breathability. Completely chemical free construction that is much better for your health. Offer excellent cervical, neck and head support in all sleeping positions, aiding to relieve pain and tension in the muscles. Completely adjustable CertiPUR-US shredded internal fill with a zip closure for your convenience. Tempur is a well-known name when it comes to quality and supportive pillow brands. I have chosen the Medium specifically for its ideal support and alignment promotion for back and side sleepers. Features an ergonomic shape developed by doctors for superior alignment and support. Allows your neck and shoulder muscles to relax completely, to relieve Migraines, neck, back and shoulder pain. Has a firm fill and is a medium loft ideal for back and side sleepers. This pillow may require a bit of break-in time to feel completely comfortable. You are sure to love this pillow, it is an exceptional Down fill top with moldable memory foam in the center. An excellent choice for stomach and back sleepers. 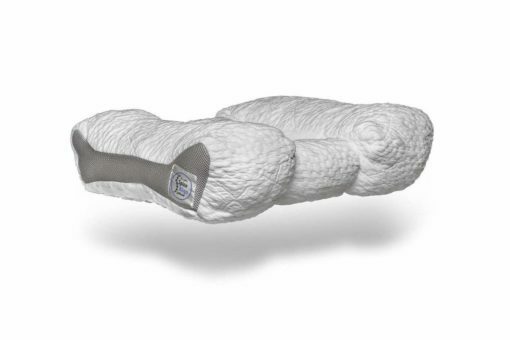 Features a down feather filled cover with a luxury cradling support memory foam center. Less heat retention and much softer, lighter and conforming to your ideal body shape. The durable 500 thread count cotton cover is highly breathable and easily washable. Ideal for pain and tension relief while you sleep peacefully. Natural is always better, and therefore I would highly recommend the Buckwheat fill cotton covered Zen Chi Organic pillow. Great for stomach and back sleepers, offers super adjustability. Features 100% Organic Buckwheat for filling, and an all-natural cotton cover. Highly breathable with natural cooling comfort. Completely refillable so you can adjust the size and firmness of the pillow. Offers superior headache and migraine relief, as well as relief to sore and tense muscles. An excellent choice for individuals with allergies, as this pillow is completely hypoallergenic. The Epabo Contoured Memory Foam Pillow is a slightly firm, yet moldable pillow that is ideal for all sleeping positions, although I would recommend it for side and back sleepers mostly. Ensures therapeutic pain and tension relief with premium cooling fabric to keep you comfortable all night. An ergonomically contoured design to align your head, shoulders and neck properly for better support. Breathable memory foam is filling for better circulation and a hypoallergenic polyester/rayon cover. This pillow offers firm and higher profile support ideal for back and side sleepers. When you keep your focus on spinal alignment and getting the best support for your head neck and shoulder, while sleeping, you will automatically notice a reduction in pain and tension and have a much better sleeping pattern. Choosing the right pillow for your sleeping position, that offers good support and proper alignment, is key when it comes to Migraine relief and tension relief.